An illuminated manuscript of the Gospel of John from an Arabic copy of the four Gospels from 1684 AD. The copy was made in Egypt by Ilyās Bāsim Khūrī Bazzī Rāhib, who was most likely a Coptic monk. Photo credit: Walters Art Museum Ms. W.592 folio 212a, Public domain. John 1:1 - 18 Why Trust Jesus? John 4:1 - 29 Can Jesus Satisfy Our Thirst? John 4:30 - 54 Belief on What Basis? John 6:52 - 71 Where Else Shall We Go? John 8:37 - 59 Who's Your Daddy? Does John Quote the Old Testament Out of Context? Did God Leave Some People's Names Out of His Book? A ceiling fresco in the Catacomb of Priscilla, in Rome, painted circa 250 - 300 AD. 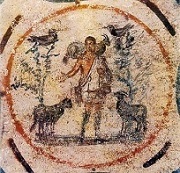 The central figure of Jesus as the Good Shepherd (from John 10:1 - 21). Photo credit: Public domain, Wikimedia Commons.